The Red Cross is in need of blood donations and has launched a new campaign to attract the attention of donors. As part of the campaign dubbed Missing Types, the letters A, B, and O — symbols of the main blood groups — will disappear from corporate logos, brands, social media pages and websites to illustrate the critical role every blood donor plays. "Every day thousands of patients across the United States rely on generous blood donors for critical blood transfusions," said Gail McGovern, president and CEO of the Red Cross. "However, we have seen a troubling decline in the number of new blood donors. We urge the public to roll up a sleeve and fill the missing types before these lifesaving letters go missing from hospital shelves." In fact, over the past four years, the Red Cross has seen the number of new donors decline by about 80,000 a year. With only 38 percent of the population eligible to give blood, and just 10 percent of those actually giving blood yearly, that's only 3 percent of the population, NBC News reported. U.S. health officials say they need to collect more than 13 million blood units annually to meet the needs of patients. The Red Cross provides around 40 percent of that total. According to the America's Blood Centers, a network of non-profit community blood centers, U.S. hospitals need 40,000 pints of blood daily for accident victims, cancer patients, those undergoing surgeries and people treated for inherited blood disorders. All blood types are needed to ensure a reliable supply for patients. A recent Red Cross survey found a disconnect between the public's perception of blood donations and the realities of patient transfusion needs. Nearly 75 of those surveyed underestimated how frequently blood transfusions occur and more than one third of never considered that blood may not be available when they or a loved one need it. That's what happened when 12-year-old Tymia McCullough, who is battling sickle cell disease, arrived at a South Carolina hospital last year for a blood transfusion — her blood type was not available. "It was the scariest, most frightening moment of a mother’s life, because I thought that she would not be able to get it," McCullough's mother, Susie Pitts, told the Red Cross. "In that moment, in that experience, I was very afraid. I was scared for my daughter’s life — what was going to happen if she didn’t get the blood she needed?" With no widely used cure, McCullough relies on regular blood transfusions to treat her sickle cell disease, an inherited disease that causes red blood cells to form an abnormal crescent shape. After eight hours, the hospital was able to get the needed blood supply for McCullough's transfusion. "Blood shortages are not uncommon in the United States and can only be prevented when more people roll up a sleeve to give," the Red Cross said in a news release. The Red Cross campaign comes ahead of World Blood Donor Day on Thursday, June 1. Among the companies joining the #MissingTypes campaign are Adobe, Anheuser-Busch, Google, PayPal, Mastercard and Oreo. Celebrities are also bringing attention to the need of blood donors, tweeting their names with the missing letters. 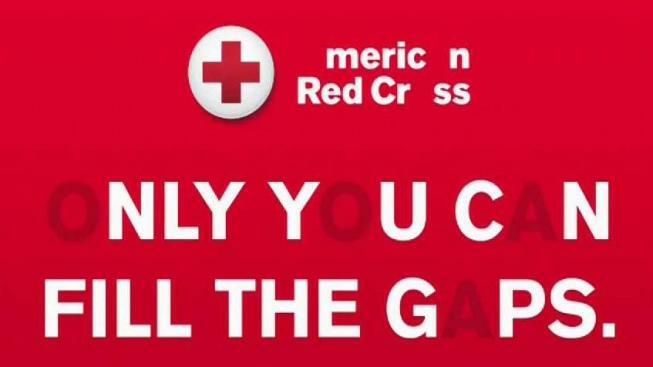 To learn more about how to donate blood or to find a drive near you visit www.redcross.org/give-blood.